I've posted my Sim Tower guide and media for more in depth strategy. Story: There is no official story to Sim Tower. You, as the building owner, have the ability (money, instant labor and construction) to create a towering building that could rival any skyscraper of that era. Your goal is to achieve stars which are based directly on your tower population level and certain structures being built. The ultimate goal is to achieve 5 stars by building a cathedral on the 100th floor which costs millions of dollars. Keep your tenants happy by making sure there are a lot of elevators, rent is “low” and they don’t have to travel far to get to their destination. Gameplay: This game excels in gameplay. You start out building office spaces and eventually move on to building hotel rooms, exhibition areas and movie theatres. What follows is a synopsis of the gameplay which is probably thorough enough to be a Sim Tower strategy guide for people interested but you can also check my more detailed guide using the link above. Elevators: Somewhere before your first star, you are going to want to build an elevator. This is an elevator simulation after all and elevators are the backbone of your Tower. They are imperative and the most valuable building you can create. Without an elevator, your tenants would have to use stairs and they HATE stairs. They tolerate escalators later when you can build them, but I always stick to elevators. 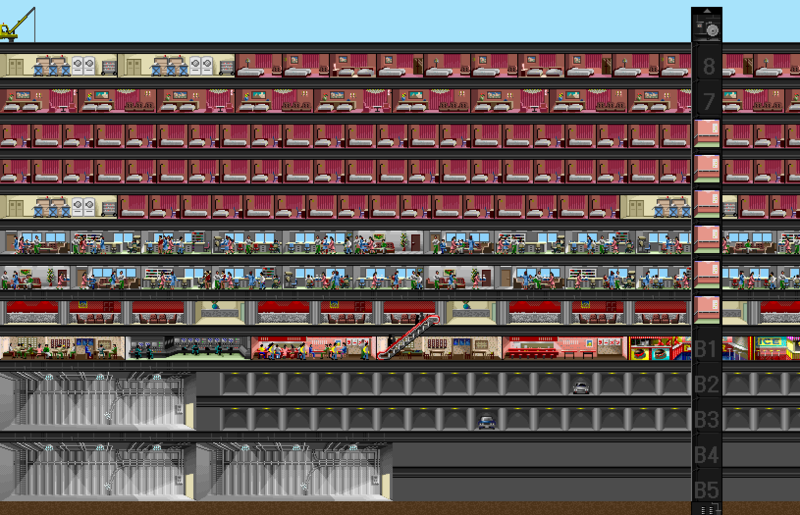 If you want to have office tenants, you need enough elevators/elevator cars that people don’t have to wait or they may eventually leave your tower. Utilizing your quick wit, you build office spaces on the second floor and build from there. At 1 star, there are a few more building options but you are still building the same old office spaces. At two stars, you have the ability to build hotel rooms. For a beginners, this is a challenge because you need to build other structures to maintain and support hotel rooms. First you need to build hotel rooms on a dedicated floor. Next you need to build housekeeping/maid service buildings to clean the hotel rooms you will build. Without maids, the hotel room will get dirty and in a few days, reach “roach” status where it can’t be “cleaned” and you have to manually delete the building. The difficulty in hotel rooms comes to the fact that unless the maid building is on the same floor as the hotel rooms, then the maids can’t reach other floors without a special “Service” elevator. 3 stars and above: the gameplay orients towards either developing lots of hotel rooms, offices or both. You want to make sure that each floor is dedicated to one type of building. 3 stars is where most of the buildings are unlocked to use. Going from 4 to 5 stars requires 10,000 people plus a metro. Going from 5 stars to Tower status requires 15,000 plus the Cathedral. These phases take a lot of time to reach. Sound: There is no music in the game, but the music is amazing. “How is this possible?” you ask. There is no music when you are playing Sim Tower because the sounds of the tower are music; that’s the beauty of the sound design. The voices of the people entering your tower, the Zen-like elevator “vroom” noise and other sounds come together to create a great spontaneous music soundtrack. “Yes, there is a new owner here.” “Riiing” “Cha-Ching” These are but a smattering of the excellent sounds the player will hear. The primary sound will be the elevator sounds and they are not annoying like I would have expected from a design perspective. Listen to the loud “clank” sound (not the best way to describe it) when monthly rent or any income is made and tell me that it’s not a reinforcing sound. The Bottom Line: Sim Tower is the best tower simulation game ever made (besides Yoot Tower). If you have a chance, please go out and buy/download the game and experience the wonder of Maxis’ classic simulation games. I’ve spent a lot of time playing the game and can highly recommend it. Yoot Tower as a sequel is a superior game, but I love the charm of the original. MAC/PC reviews game: Classic games are usually overhyped, but we love classic Maxis games. 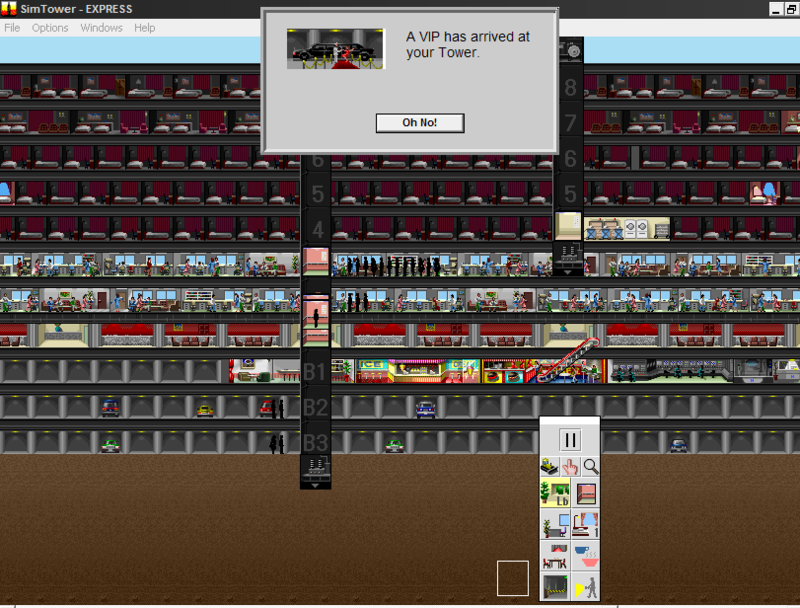 Sim Tower is a tower building simulation that we don’t mind repeating over and over. If you aren’t playing Sim Tower as a classic game, you better be playing Sim City 2000! Been playing Sim Tower for easily a decade now. Just re-installed it today and got a good 3hrs straight play time into it. Can't recommend it to enough people, and hopefully I can find a copy of Yoot somewhere to try out.